Pharmacological assays carried out in transfected cells have been very useful for describing the mechanism of action of cathinone new psychoactive substances (NPS). These in vitro characterizations provide fast and reliable information on psychoactive substances soon after they emerge for recreational use. Well-investigated comparator compounds, such as methamphetamine, 3,4-methylenedioxymethamphetamine, cocaine, and lysergic acid diethylamide, should always be included in the characterization to enhance the translation of the in vitro data into clinically useful information. We classified cathinone NPS according to their pharmacology at monoamine transporters and receptors. Cathinone NPS are monoamine uptake inhibitors and most induce transporter-mediated monoamine efflux with weak to no activity at pre- or postsynaptic receptors. Cathinones with a nitrogen-containing pyrrolidine ring emerged as NPS that are extremely potent transporter inhibitors but not monoamine releasers. Cathinones exhibit clinically relevant differences in relative potencies at serotonin vs. dopamine transporters. 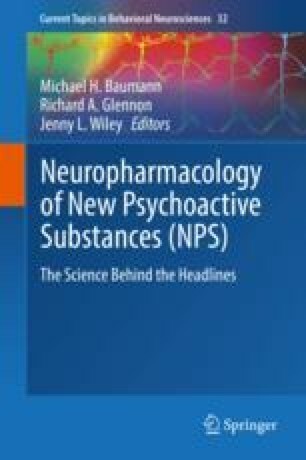 Additionally, cathinone NPS have more dopaminergic vs. serotonergic properties compared with their non-β-keto amphetamine analogs, suggesting more stimulant and reinforcing properties. In conclusion, in vitro pharmacological assays in heterologous expression systems help to predict the psychoactive and toxicological effects of NPS.